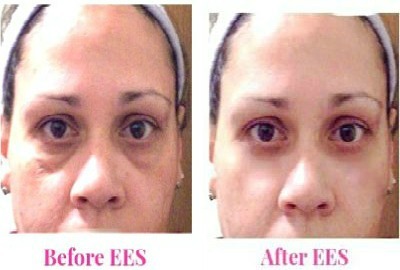 Under Eye Bags Treatment - This Still Works! My "go-to let's fix those bags under eyes treatment"? Ummm....That will be the EES serum! This is the only treatment for under eye bags and wrinkles that I’ve found that really works for me (and others) without harsh side effects! I’ve been using this serum since 2012 and you know what? I keep searching - just in case there is something even better out there........ but so far, this is still the best. Why keep searching for other under eye bag treatments? I’m always looking for that "perfect under eye bag treatment" because I’m amazed how different I look (and how different I feel) when my eyes are NOT puffy or swollen. I don’t know why some days my eyes are worse than others – perhaps it’s diet or lack of sleep – but I don’t care! I just want it fixed! I hate that look and I feel very self-conscience when my under eye skin is baggy, discolored, wrinkled or puffy. The problem with most other under eye bag treatments? Lots of products promise to firm up baggy eyes, puffiness, and wrinkles and lose skin. But (at least in my opinion and experience) they have all been too harsh, too drying, or too flaky. Yes! They work for the first 15 seconds. I look great and as soon as I smile or move my face – I see white flakes, peeling, or worse….dry crinkled under eye skin! Or some left a whitish film across the lower lid. Which really isn't a bad thing if you have dark circles, but it dried out my skin and actually accentuated those lines and wrinkles under my eyes. I know that many of these instant eye lift serum or gels usually have a learning curve. I know you have to learn when, where and how much to apply to get the right fit for your particular situation. And trust me, I’ve taken the time to learn that curve in hopes to get the results I wanted. But the one I keep going back to over and over again is the Easy Eye Solutions Instant Eye Tuck and Dark Circle Treatment. This serum is soft, fluid, and flexible. As opposed to those other products that were more “glueish” in consistency. If you have super sensitive under eye skin – you can even add a tiny drop of water to the serum to thin it out even more. Then if you need to you can always add more serum for a better effect/result. This is what is meant when someone says their baggy eye treatments or serums have a learning curve. With this product it means you can play around with this pliable serum (use less, use more, add a drop water to it) to find the fit that works best for your skin type and situation. The other benefit is that you can apply this serum on top of your makeup and eye creams – whereas the others state you need to apply it on clean, dry skin. Throughout this website you will see videos and pictures of me and other people (and some friends of mine) using this serum and getting good results. The bottom line? We all know getting rid of dark circles and baggy eyes is pretty difficult. Some puffy eyes conditions can be fixed with surgical procedures like under eye surgery to remove fatty deposits. But, if you’re looking for a quick fix treatment that not invasive and can provide some relief from puffy baggy under eyes – I think this is a winner!